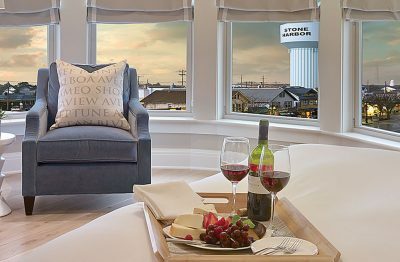 With beautiful panoramic views of downtown Stone Harbor, these guestrooms are in high demand because of their unique coastal charm. A guest favorite, these spacious accommodations are full of character including a fireplace and quaint window-side seating nook with a birds-eye view of 96th Street, Stone Harbor. 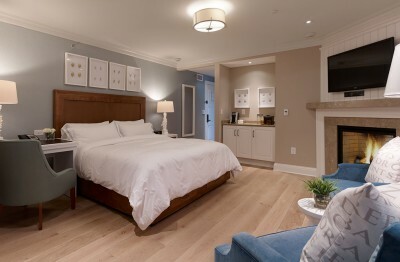 These rooms feature warm and rustic white oak flooring along with custom white furnishings. Headboards with woven rattan insets compliment the warm sand tones and cerulean blue accents. Playful nautical details adorn these guestrooms with King bedding. Bathrooms have classic subway tile wainscoting, frameless glass enclosed shower, marble top vanity and LED lit make-up mirror. 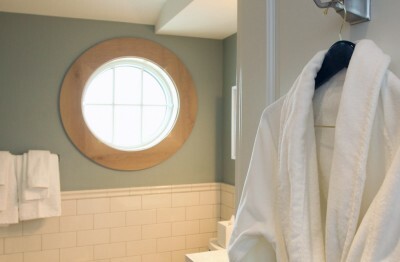 Guests can also enjoy the conveniences of a Keurig coffee maker and under counter refrigerator.